CONTOUR I is designed for deep kneading massage, providing relief for tired fingers and thumbs, and helping with hard to reach places. Try these different techniques, then create your own. Go with what feels good. * Single Node, Deep - Brace one round end of CONTOUR I in the palm your hand, and support the narrow stem with your thumb and fingers. This focuses the massage pressure on a very small area of the body, allowing deep stimulation of the muscle. This creates an effect that’s similar to using your thumbs to give a massage, but without the strain on your hands. * Single Node, Shallow - Position CONTOUR I so that one round end is in the palm of your hand, and the narrow stem passes above your hand between your thumb and forefinger. This allows you to simultaneously use your hand and the smooth spherical end of the massage stone, combining the sensations from your fingertips with the stimulation from CONTOUR I. * Dual Node - Lay CONTOUR I on the body, then roll it lengthwise along the muscle group. Both nodes will make contact with the skin, applying lighter pressure to both points in tandem. This works well for massaging the length of the back, bridging across the spine. This technique is low-friction, as the stone is rolling along the skin rather than sliding. * Multi-Stone - CONTOUR Ceramic Massage Stones can also be used together - place CONTOUR M over CONTOUR I and roll across the skin for a zero-friction massage. Or use one CONTOUR I or one CONTOUR M in each hand to give a symmetrical massage and cover more of the body at once. You can also start a massage with CONTOUR I, then move to CONTOUR M, or vice versa. - Heat CONTOUR I by submerging it in warm water. Warmth is relaxing and encourages circulation. - Cool CONTOUR I in the refrigerator or by running under cold water. Cold is invigorating and refreshes the body. * Lotion - To add to the experience, pair CONTOUR I with BEYOND Sensational Massage Lotions for a Warming, Cooling or Euphoric massage. 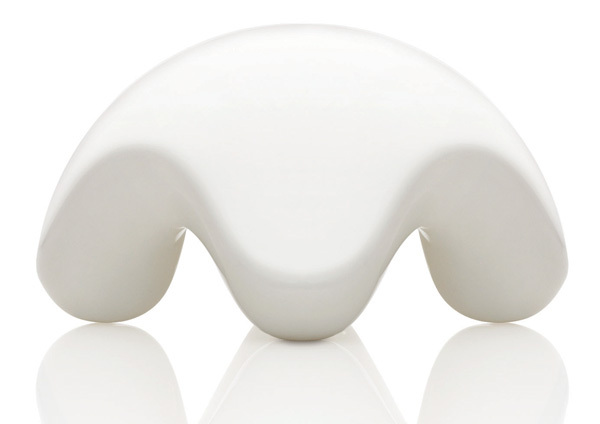 * Get Creative - CONTOUR Ceramic Massage Stones are made from hygienic, biocompatible, non-porous porcelain. They are designed for exploring the body, so enjoy their versatility. Of course, please use common sense.